Patrick Thibeault is a twenty-year veteran of both the active Army and the Army National Guard. Patrick fought in Operations Desert Shield and Desert Storm back in 1990 and 1991with 3rd Battalion of the 160th Special Operations Aviation Regiment (Airborne) and was sent to Afghanistan with the 76th Infantry Brigade as part of Task Force Phoenix in 2004 and 2005. 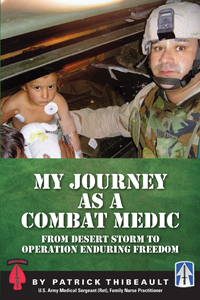 His military education includes basic Army medic school, Airborne Jump School, Flight Medic School, High Risk SERE School, and Primary Leadership Development. His military awards include the Meritorious Service Medal, The Air Medal, The Combat Medic Badge, Second Award, Parachute Badge, Aviation Crewmember Badge and the Expert Field Medical Badge. His civilian education includes a Master’s Degree in Primary Care Nursing and certification as an Emergency Medical Technician. Patrick retired from the Army National Guard in January 2011. He works full-time in an inner city medical clinic in an urgent care and primary care setting as a Family Nurse Practitioner, and part-time as a Registered Nurse in a Medical Intensive Care Unit. Patrick lives in Indianapolis, Indiana with his wife Connie and their dog Rocco and cats Savannah and Georgia.